I couldn't really find advertised military discounts online, so you'll have to call and ask or hear from others wether your favorite store has discounts. 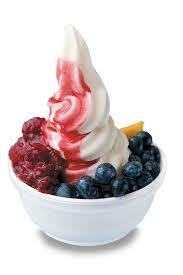 Many of these yogurt places are franchises so they may vary from location to location. Not all yogurt stores have discounts. For example, popular Pinkberry and Menchies do not have discounts. There are hundreds, maybe thousands of yogurt shops everywhere, so let us know what places you have found that offer discounts and I'll add it to the list!